Do you ever find yourself thinking and thinking about something you know you need to do, but not actually doing it? In those moments of procrastination, the task seems to grow exponentially more difficult and tedious. Delay can turn almost any project into a mental mountain. I have to be honest, that’s what I was doing with Liam’s quilt. I didn’t feel like sewing with solids, so even though his idea of a wave-themed quilt was a good one, I was putting off the project for later. I guess I also thought I knew just how it would turn out. What drives a lot of my making is that element of discovery - how will this fabric look, this pattern, this combination of colors? Liam’s all-blue-solids parameter felt so “done.”. Boy was I wrong! It wasn’t until I was already started that he asked me to sort the blues from light to dark. 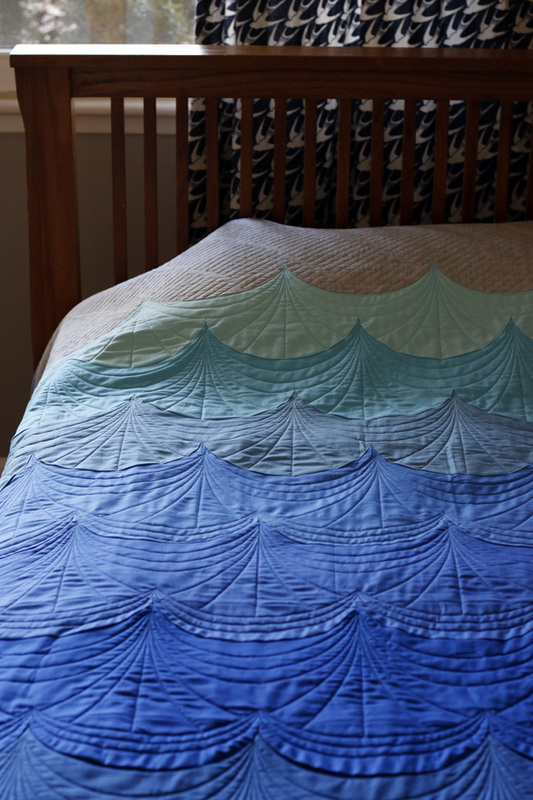 Such a simple idea, but I don’t think I’ve ever made an ombre-look quilt before. And then working with the blues took thought as well. I had to switch out Freespirit Solids Mineral for Freespirit Solids Indigo. Mineral, though a favorite shade of mine, had too much green for these waters. Try something new this year! The Leather Handle Tote Bag Kit from Crosscut Sewing Co. includes written directions, magnetic snaps, bag bottom, leather handles and rivets. This tote is the perfect size for everyday use! The tote handles are top quality genuine leather and are sized to fit over your shoulder or in your hand without touching the ground. Canvas or heavier weight fabrics are perfect for the exterior. My interest in the project really took off when I brought it to the quilting frame. Solids are an invitation for custom quilting. Creating a quilting plan for this quilt was all about discovery. Happily, I think I succeeded in bringing even more movement and energy to the waves. The diagonal lines over the gray skies were a final touch. A little rain for Liam’s stormy sea. Looking back it’s clear now that this project was a gift to me. It was a chance to love Liam by bringing his vision to life and a chance to show him how much I care by going the extra mile with my skills. At his age (almost 12!) hugs and cuddles are out. Alone time is in. I’m very grateful for the chance to show up for him in this way. This twin sized quilt is backed with a wide-back Color Weave purchased from Pineapple Fabrics and bound with my zigzag binding technique in Netorious Velvet Sky by Cotton & Steel. All solids are Freespirit Designer Essential Solids including: Clearwater, Cerulean, Cadet, Cornflower, Indigo, Cobalt, Royal and Freedom Blue. You can find the Freespirit solids line at Gotham Quilts.